CLIA recently reported that 2013 was another record year for the UK cruise market and even more people are showing an interest in cruising than ever before. With an increase in the number of ships that will sail from British ports in the coming years, we hope that this trend continues. In order to stay at the top of their game, cruise lines continue to make investments in their on board offerings to ensure service remains high and guests have a wide choice of experiences, particularly in the area of on-board cuisine. Food plays an important part of any great holiday and today’s travellers are always on the hunt for new culinary experiences. A cruise can provide a dining option to suit every palate, from a range of on board restaurants to the latest food trends. 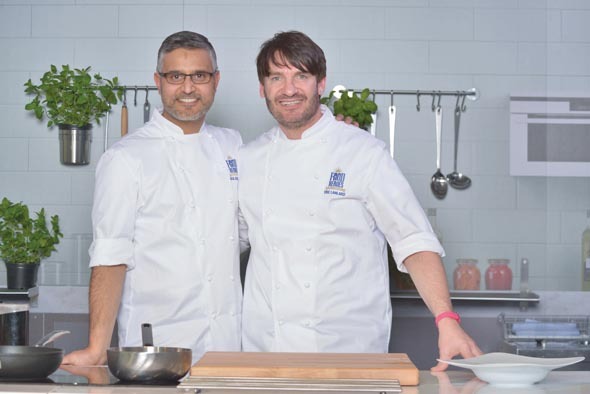 Celebrity chefs are also a big draw, so I was interested to read that P&O Cruises is featuring five celebrity ‘food heroes’ on its brand new ship Britannia which launches next year. But P&O is certainly not alone when it comes to the gastronomic delights that await today’s cruise passengers and it’s clear that all cruise lines attach great importance to the on board dining experience. The likes of James Martin, Marco Pierre White and Atul Kochhar – three of P&O’s heroes – are in good company in offering exceptional food. Indeed, all cruise lines offer extraordinary dining experiences, from the main dining room to alternative dining restaurants, and even on-board venues that offer a ‘dinner with a show’, such as the Illusionarium on the recently launched Norwegian Getaway. Guests are now able to sample the delights of many renowned chefs including Master Chef Rudi Sodamin on Holland America Line and Silk Road by Nobu Matsuhisa on Crystal Cruises; as well as Todd English on Cunard Line and Geoffrey Zakarian on Norwegian Cruise Lines. Then there is Oceania Cruises which specialises in epicurean cruises overseen by master chef Jacques Pépin. Most recently, Jamie Oliver announced a partnership with Royal Caribbean to open the first Jamie Oliver eaterie at sea. The company’s most innovative resort ships, Quantum of the Seas and Anthem of the Seas will feature a Jamie’s Italian on board, bringing with it the world famous chef’s own approach to food and dining, which is to serve simple, fresh ingredients, emphasising the importance of locally sourced produce. But great culinary experiences stretch beyond celebrity chefs – there’s QSINE from Celebrity Cruises and Eataly Steakhouse and Ristorante Italia on MSC Cruises, amongst others. All of these partnerships bring guests even more choice to an already wide selection of dining options. Another growing trend is culinary themed itineraries which can range from a chocolate connoisseurs cruise with AmaWaterways, exclusive cookery courses in Hapag-Lloyd Cruises’ Miele Culinary School or a five day gastronomic cruise with CroisiEurope, allowing guests to indulge in a variety of regional dishes that complement the region through which they are travelling. Dining is such an essential part of a cruise holiday with great food and service available at every meal time, every day. The breadth and quality of dining proves that a cruise can offer holiday experiences that just can’t be found elsewhere.